Working with hazardous liquids puts you at high risk of chemical burns and other injuries. The Uvex Profabutyl Chemical-Resistant Butyl Rubber Gloves B-05R have been designed to shield your hands and parts of your forearms from a range of chemicals, as well a minor tears and abrasions. They offer excellent grip in damp and wet areas, which further reduces the chances of potentially life-changing accidents at work. 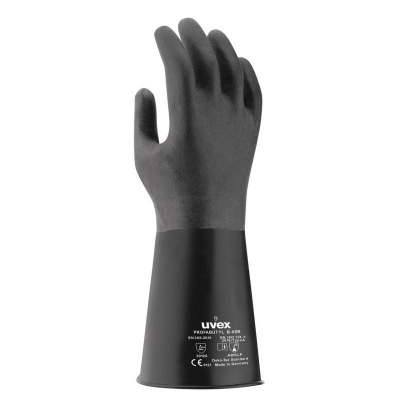 The Profabutyl Butyl Rubber Gloves B-05R are available in three sizes. Please measure the circumference of your hand around the knuckles (excluding the thumb) with your hand open and your fingers together, and the length of your hand from the tip of your middle finger to your wrist.